There are days when we all wish we could be happier and we dream of a time in the future when things will work out, when we can be who we’ve always wanted to be, but the reality is quite different. The reality is we all must find and use ways to live life intentionally and create our own happiness. If we wait for someone else to create it for us, or circumstances to be just right, we may be waiting the rest of our lives. 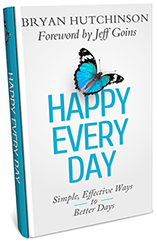 In my new book Happy Every Day – Simple, Effective Ways to Better Days I present 26 simple, realistic and actionable strategies to help you become happier and live with more passion and satisfaction. I wrote this for anyone who might be stuck like I was, waiting for the next shoe to drop and allowing too much time to pass without realizing the power we already have within ourselves. To help others discover the amazing power that resides within all of us to make the best out of each day. I’ve read hundreds of books about happiness, and maybe you have too, but what confounded me was how much time was spent explaining what happiness is and then over explaining how to achieve it. I don’t waste your time, or mine, in this book. You know what happiness is for you. You don’t need anyone to explain it. That’s ridiculous. What you (or someone you know) might need, as I did, are basic steps that anyone can use at any time to achieve happiness on a regular, predictable basis. All of the strategies in this book are stripped to their core, short and easy to implement without all of the over explanations. And that’s the problem about the usual directions about becoming happy, they are way over done and by the time you’ve exhausted yourself reading them you’re not really any closer to being happy — in all likelihood you’re even more frustrated than you were. You know that and so do I, and that’s why I wrote this book. If you’re ready to stop waiting for the perfect setup or for someone to give you permission in some way to be happy, then this book is for you. If you’re frustrated with little things getting you down, or others influencing your happiness in a negative way, then this book is for you. 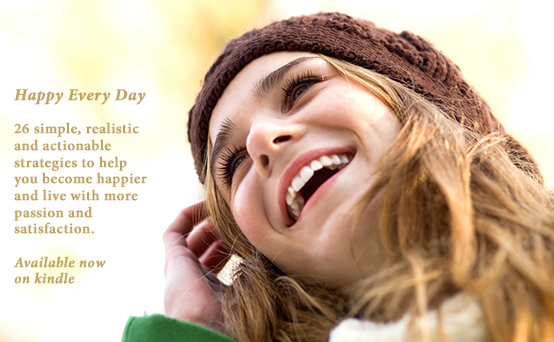 If you just want basic, easy and effective ways to become happier, this book is for you. It’s time to take control of your happiness. And you can. It’s a manual for life, for how to live with more significance and greater satisfaction. As you step into this journey of purpose and passion, you may just find yourself happier than you’ve ever been. I truly hope so. This is my first book published for everyone with or without ADHD. Happy Every Day is about life and happiness for all people in all walks of life. Bryan, from his own life experiences and dedicated study, provides a road map to make our journey more enjoyable, more pleasant and more positive. He provides an excellent framework for mindful, joyous living. Help me spread the word about this exciting new release by sharing this post and the book on facebook, twitter and all of your favorite social networks. If you know someone who could use a lift, please feel free to email him or her this post. 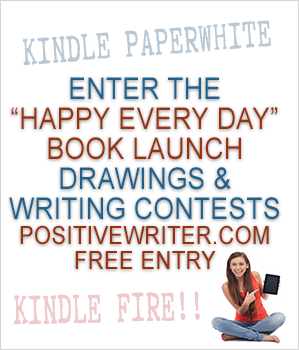 I have created 2 drawings and 2 writing contests to celebrate the release of “Happy Every Day” on Positive Writer, and I welcome you to take part and get your name in the hat. I had several “why didn’t I think of that” moments while reading this book. Thank you for helping spread the word and after you’ve read the book, come back and share your thoughts with me about it. Many of you remember my incredibly popular eBook “How to be Happy Every Day”, this new book is a revised, updated version with new content and additional strategies. Get it on Amazon. And, or go to the drawings and contests and enter to win!